but the chillin's were not havin' any of it! Hopefully tomorrow?! I was almost all done, thought I knew what I was going to do with it, and then totally changed and did something way more awesome to the bench. I hope you're in suspense. Cuz I am - since I'm not finished yet and still not sure how it's all going to come together - but it always ends up workin' out in the end! :) Check back tomorrow! Now let's have a PARTY!!!!!!!!!! 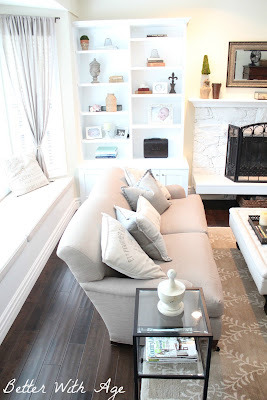 Better With Age did some UH-MAZING, jaw-dropping, transformations to her living room (with some handy-man hubby help!). Incredible before and afters! 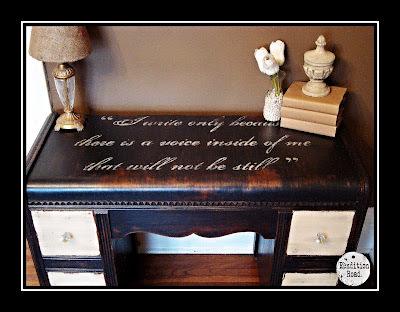 Rendition Road recorded a "how to" video with this beautiful desk redo! Dear Olympia Furniture Revivals rocked this side table. I wish it was mine. Aww thanks for featuring my living room, Kammy!! Thanks for hosting this week! Kammy, I'm loving that desk that you featured! Pieces like that are what parties are all about! Thanks for hosting! Thank you so much for featuring my desk Kammy!I was absolutely tickled when I saw it! AND thank you for hosting a great party each week! Have a wonderful day. I am back! I have been out of the party circle for a while with working full time but am trying to join a few fun ones, like yours. Thanks for hosting! Hope you like my carrot earrings. Off to check out some of the other sweet links. Woohoo! Thank you for featuring the side table. I LOVE, LOVE, LOVE your piano!